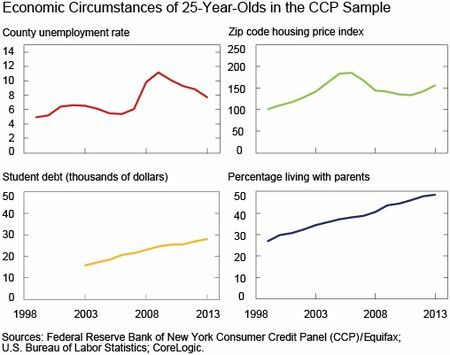 In a new Federal Reserve Bank of New York staff report, we discuss our analysis of these trends using the New York Fed Consumer Credit Panel (CCP). 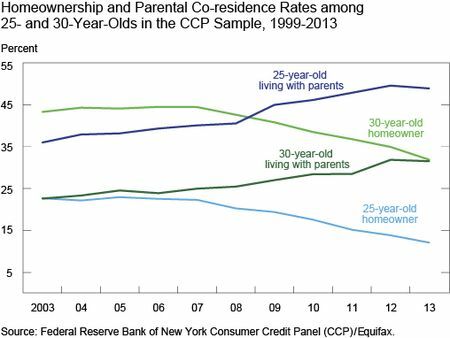 The CCP is a unique data set that includes information on the ages and locations of a large, representative sample of U.S. individuals and households. This data set’s size allows us to analyze residence patterns for very narrow age groups, here twenty-five- and thirty-year-olds, at very fine geographic levels. Such fine age and geographic detail helps us distinguish among the various local economic forces that may be driving young people home. 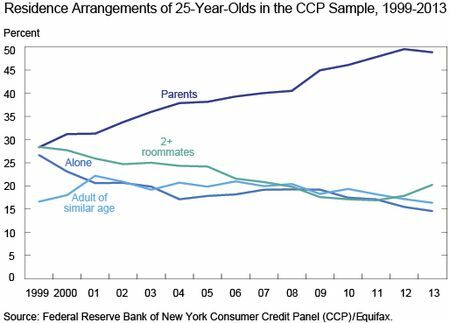 Being from the generation under analysis, I think student loan debt to income ratio is absolutely correlation, but only part of the cause. The chart of the country shows the rates of living at home are highest in the most expensive places to live. Crappy temp jobs are in abundance in those cities, and low wages keep people living at home. Low savings rates are certainly hurt by student loans, but other expenses that come with living in expensive places are a culprit too. All Hail the Daily Show!